My New Clothesline Book is on AMAZON.COM! Or here is the link on Amazon. I have been working on my clothesline book for a long time, since I first came home from Italy in 2011 with 75 pictures of clotheslines. (See full description below.) My friend Krista introduced me to Create Space in August (the date next to the title on Amazon) and I just completed the publishing process with her on Friday, so I am very excited about having my book available to all of you so quickly after I finished the final proof. I am investigating how to put it on Kindle and will post that as soon as I do, but because it has so many photos, you may prefer the paperback version. If you like the book, I urge you to use the link to review it. The urge to write For the Love of Clotheslines came from our trip to Italy in 2011, where I took more photos of wet clothes hanging on balconies and on clotheslines in villages and small towns than I did of statues and churches. Something about seeing the clotheslines triggered strong memories of my childhood. Women’s Voices for Change printed my online article and photos from my trip, read by Kathleen Arleth, a gallery owner in Somers Pt., NJ and she asked me to do an exhibit of my photos. What a bonus! I then took additional clothesline photos in nearby Lancaster County and also asked family and friends to take photos on their trips. 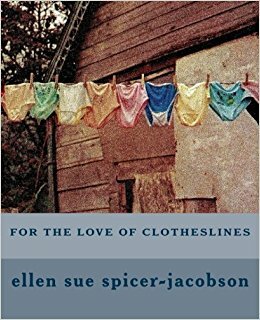 I added research on clothesline history, my article about Italy in Women’s Voices for Change, and poems from other clothesline lovers. Voila! A photo book with text was born to be enjoyed by young and old alike. It can be used as a coffee table addition, and would make a great gift for photo lovers and people who like to reminisce. The book also makes a pitch for bringing back clotheslines as a way of “going green,” so people concerned with the environment will enjoy it also. The Foreword by clothesline lover Anne Lawrence is entitled “Clothesline Memories,” so it is especially suited for people who remember their moms hanging clothes on the line, winter and summer. Whether for nostalgia, the love of photographs, a concern for the environment, or just for the fun of reading about a subject not many people would bother to write about, you may find this book delightful, fanciful, educational, and enjoyable. The book has also given me a sense of community because of my contact with other clothesline lovers and people willing to take photos when they travel. I feel a kinship with them in this joint endeavor. This book is a labor of love that would have been impossible without the help of my friend and writer Krista Nelson. Her knowledge of Create Space and her skills with design made this book project happen. Celebrate clotheslines in all their windswept and sun-drenched glory with your very own copy of For the Love of Clotheslines! This entry was posted on Sunday, October 15th, 2017 at 1:30 pm	and is filed under Home Page, My Books and My Pics, Reviews. You can follow any responses to this entry through the RSS 2.0 feed. You can skip to the end and leave a response. Pinging is currently not allowed. I just placed my order. It will arrive in two days!! Congratulations, Ellen Sue, I’ve ordered a copy! Fabulous! So excited for you. Can’t wait to get my copy, which I just ordered. Maybe I’ll even recognize some of the locales.